The Greater Mekong, including Vietnam, is expected to have a colossal US$66 billion poured in to strengthen regional economic co-operation in the next five years, said an Asian Development Bank (ADB) official on Tuesday. Director of ADB’s division of regional co-operation and operations coordination in Southeast Asia Alfredo Perdiguero. The money was upped by $2 billion compared to what ministers of the six Greater Mekong Sub-region (GMS) countries – Myanmar, Laos, Viet Nam, Cambodia, Thailand and China – agreed to in the action plan framework for 2018-2022 late last year. It will more than triple the total amount of $21 billion mobilised for the region since the GMS development programme was first launched by the ADB in 1992, the bank’s division of regional co-operation and operations coordination in Southeast Asia director Alfredo Perdiguero told the Vietnamese media. The ambitious financing agreement is due to be signed by leaders of the regional members at the triennial 6th GMS Summit hosted this March in Viet Nam, in which hundreds of projects from different sectors will be put on the agenda to open more opportunities in trade and investment through closer regional collaboration. “Some $7 billion will be mobilised from the ADB. We will also bring in many other partners to contribute significant amounts, together with the governments of the GMS countries,” Perdiguero said. “I can say the GMS has been one of the most successful programmes for regional co-operation and integration in Asia,” he said. The development of extensive trans-national road networks which formed the three main economic corridors, or trade routes, connecting the member countries was so far the greatest achievement of the programme, given that there was little transportation connectivity in the region back in 1992. Viet Nam, in particular, was the only country in the GMS that participated in all three economic corridors, according to Perdiguero. They included the North-South corridor that connects Viet Nam with China, the East-West to link central provinces of Hue and Da Nang with Laos and all the way to Thailand and Myanmar, and finally the Southern one bridging HCM City with Phnom Penh and Bangkok. But as the development of physical connections in the region, which set the foundation for the countries’ connectivity, was relatively complete, the GMS programme was seeking to expand the collaboration in several other sectors. Perdiguero said that they would range from power connectivity, agriculture to health and diseases, together with tourism and urban issues. Fruitful co-operation in those fields would involve not only the governments but also a bigger contribution from the private sector, particularly in tourism and agriculture, he added. 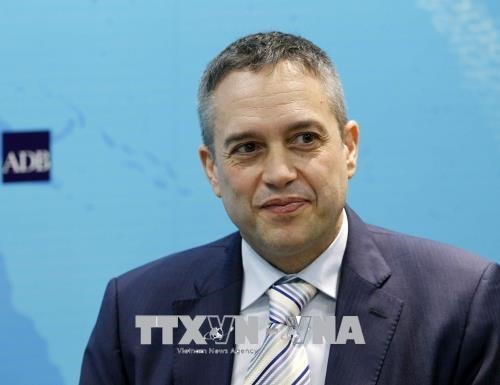 “That’s why we are very happy that the (Vietnamese) Prime Minister decided to organise the GMS Business Forum to bring in the energy, the ideas, and the knowledge from the private sector,” Perdiguero said.